Ayn Rand, "The Moratorium on Brains"
The awards recognizes business which continuously improve performance for the clients' profits through sale of processes, products and services. Leo has been recognized as a leader in manufacturing quality plant and equipment backed by more than a decade of experience in providing automation excellence for the Road Construction industry. Today LEO Road Equipments Pvt. Ltd. has earned a name of repute and is synonymous with quality products, after sales service and maintaining excellent customer relationship. 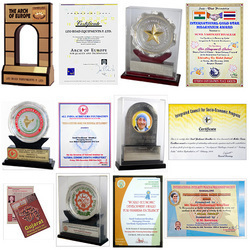 Awards and achievements bring accolades and help us to outdo our earlier track record. To add to our credit we have installed numerous plants and all running successfully throughout India. The company has also supplied its equipment and plants to leading contractors and multinational companies engaged in Road construction industry. Fortune, one of the world’s most prestigious magazines.